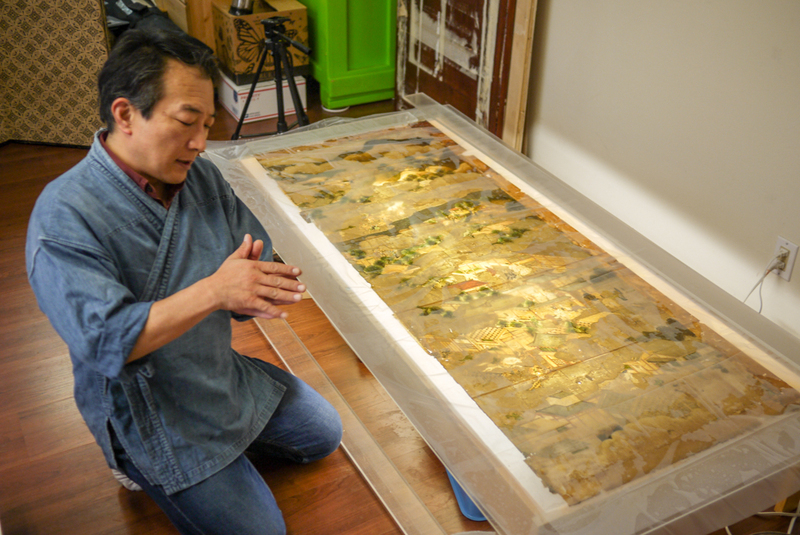 Thanks to funding from Bank of America’s Art Conservation Project, a pair of important 17th-century Japanese screens, Scenes in and around the Capital, are currently being restored by specialists at Studio Sogendo, a private studio in California. 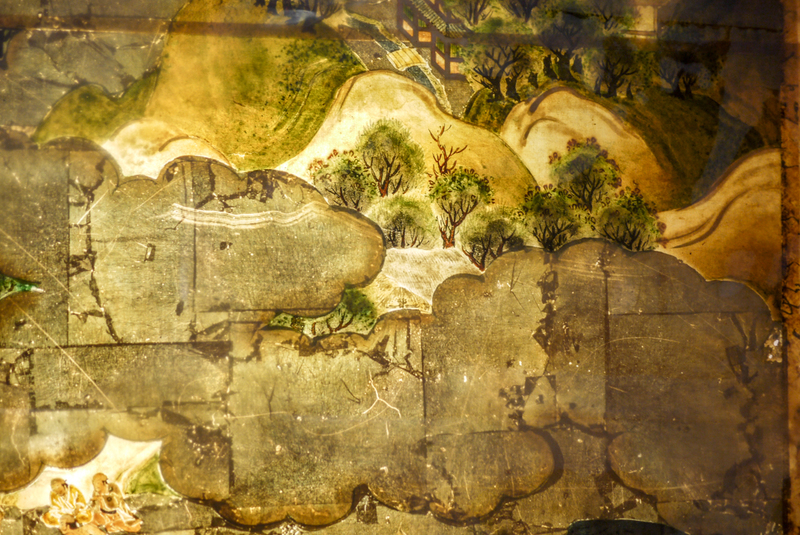 The screens, likely created by a machi-eshi, or “town painter,” present a panoramic view of Kyoto during the Edo period. They show both Kyoto’s center and its periphery, and give insight into the daily lives of different social classes, in addition to representing seasonal festivals. When the screens first arrived at SAM in 1975, they were already in fragile condition and by the time this conservation work began in 2017, extensive repairs were desperately needed. 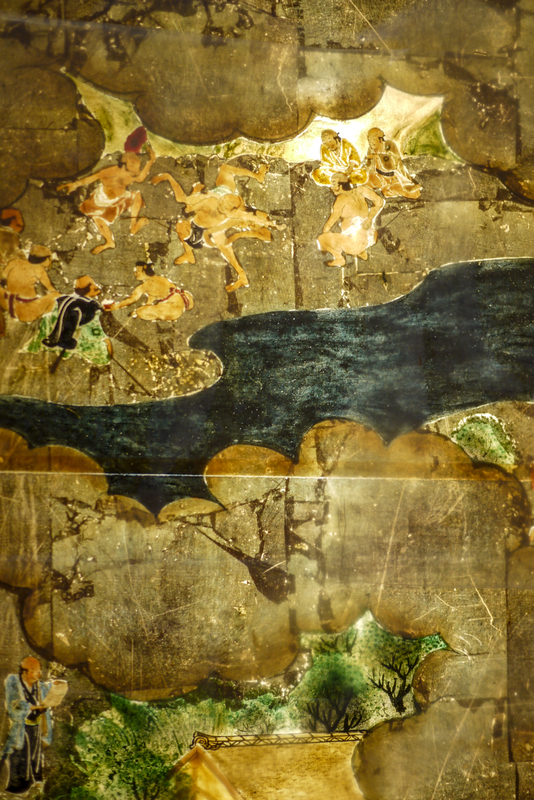 Painted using ink, color, and gold, and mounted on wooden frames, the screens are being restored using traditional Japanese methods and materials. I was able to visit Studio Sogendo while one of the panels had been stripped of its backings and laid on a light table, allowing a rare perspective of the materials and quality of the painting. 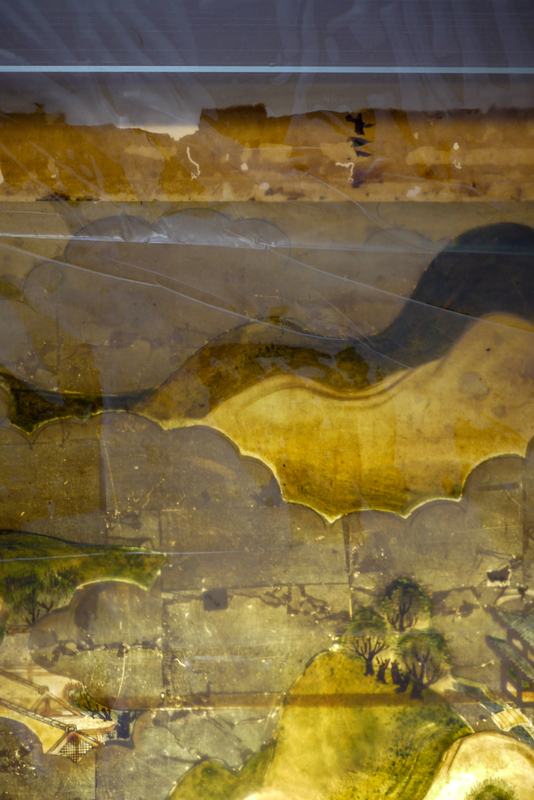 The conservation treatment has been invaluable, not just in terms of preserving the paintings, but also in offering opportunities for examination and study. The internal frames must be replaced and expert craftsmen in Japan made new custom frames for the work. 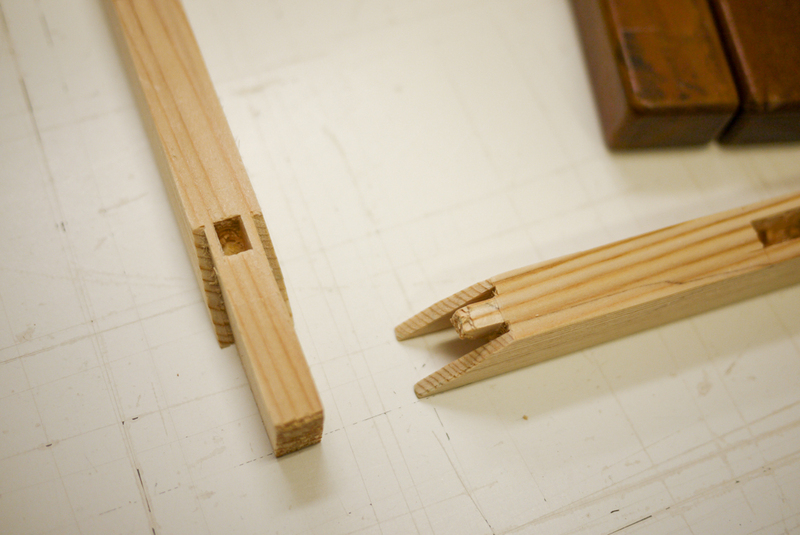 The incredibly precise joinery of the new frames can be seen in these images. The conservation phase of the project is nearing completion and the reassembly of the structure, replacement of the mount fabrics, and retouching of the areas of loss is underway. 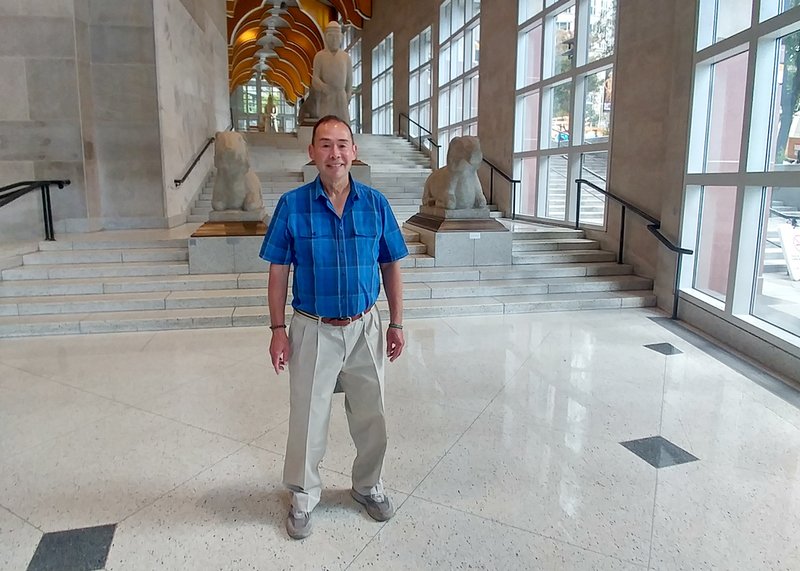 This crucial project would not be possible without Bank of America’s Art Conservation Project, one of few programs dedicated to preserving historically or culturally significant artworks. We look forward to the return of Scenes in and around the Capital, which will be on view among SAM’s extensive Asian art collection when the Seattle Asian Art Museum reopens in late 2019! For artist Do Ho Suh, clothing is the “smallest, most intimate habitat that one person can carry. 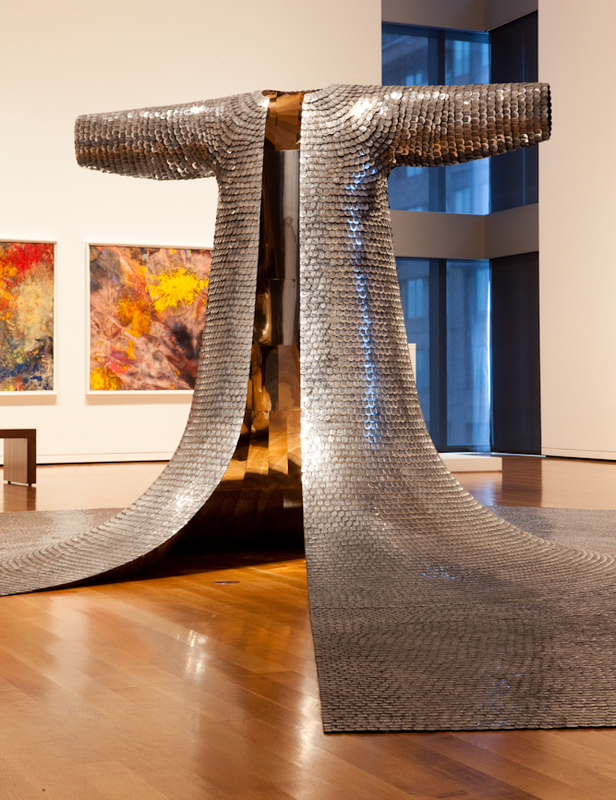 And when you expand that idea, it becomes architecture.”¹ Indeed, Some/One—a monumental armor sculpture made from thousands of military dog tags—embodies the architectural possibilities that Suh sees in clothing. Answering the question “How much space does one need to be an individual?” Suh explores the relationship between individual and collective, redefining how we might perceive this dichotomy. Some/One in particular is informed by Suh’s experience in the Korean military, which is mandatory service for young men. Unified as one coat of armor, the chain mail-like sculpture is comprised of unique metal tags—each one bearing a sequence of random letters and numbers.² The sculpture somehow manages to defy gravity despite the imagined weight of its 30,000-plus stainless steel tags. Additionally, the piece’s large fanning base serves dual purposes: it supports the sculpture structurally, as well as makes physical and metaphorical space to consider the work’s footprint. Dog tags are inherently a marker of individualism used to identify soldiers, but they also connect a troop to a larger collective and, ultimately, nation. 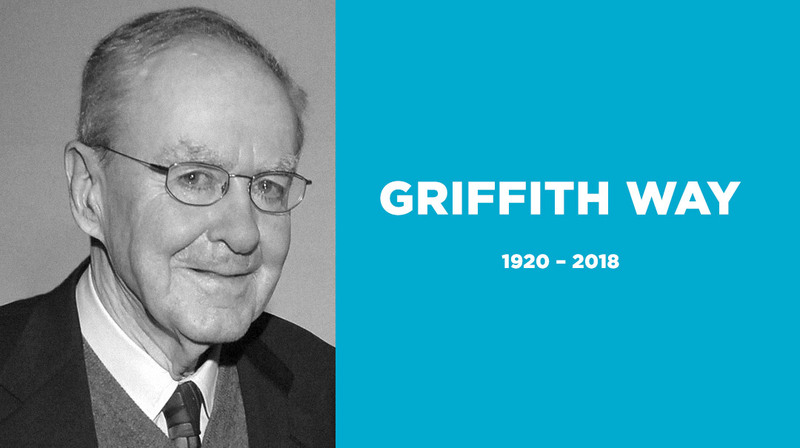 In the words of the artist, “When you see a person, you don’t just see the person standing in front of you—you see their background, their family or ancestors, the invisible webs of relationship or information.”³ When we see one person’s tag, we see so much more than a name, place of birth, or unit—we see their life. Further, the reflective surface and mirrored interior of Some/One underscores the artist’s desire for viewers to see themselves—literally and figuratively—in the work. Whether the sculpture serves as a monument honoring fallen troops or highligts the anonymity of their service (or carries other readings altogether) is willfully left open to the viewer. This work is not currently on view but it will be exhibited when the Seattle Asian Art Museum reopens in late 2019. Image: Some/One, 2001, Do Ho Suh, stainless steel military dog-tags, nickel-plated copper sheets, steel structure, glass fiber reinforced resin, rubber sheets, diameter at base: 24 ft. 4 in. ; Height: 81 in., Gift of Barney A. Ebsworth, 2002.43 © Do Ho Suh. Photo: Justin Gollmer. C. Carr, “In the House with Do-Ho Suh: World of Interiors,” Village Voice, June 23, 2003, http://www.lehmannmaupin.com/artists/do-ho-suh/press/127. Do Ho Suh, “’Some/One’ and the Korean Military,” interview by Art21, Art21, 2003, https://art21.org/read/do-ho-suh-some-one-and-the-korean-military. Geoffrey Cruickshank-Hagenbuckle, “Do-Ho Suh Reflection” Brooklyn Rail, March 7, 2008, https://brooklynrail.org/2008/03/artseen/reflection. Wander into a Chinese scholar’s studio at the Seattle Art Museum to find treasures like a masterfully carved brush pot and a tiny cage to house a lucky cricket. This display of Pure Amusements brings together objects and furnishings collected by scholars as a display of learning, a claim to social status, and an inspiration for reflective thinking. A very human desire lies at the heart of this tradition. Who, as a kid, does not build their own killer rock collection? In China, too, people have been gathering rocks for a long time. The Chinese practice of decorating gardens with rocks was in place by the Han dynasty (206 B.C.–A.D. 220). The specific tradition of the scholar’s rock has been traced back to the Song dynasty (960–1279), and it continued through the Yuan (1279–1368), Ming (1368-1644), and Qing (1644–1911) periods. Scholars’ rocks were used in several senses of the word. Functionally, they might serve as brushrests, inkstones, or censers. But their primary function was to inspire. The form of the rock suggested a mountainous landscape, and like a landscape painting, a scholar’s rock acted as a microcosm of the universe—a small piece of an infinite, natural puzzle—an object on which to meditate and to gain cosmic perspective.³ They would be displayed indoors on a desk, on a table or bookshelf, or perhaps on the floor if they were especially large. 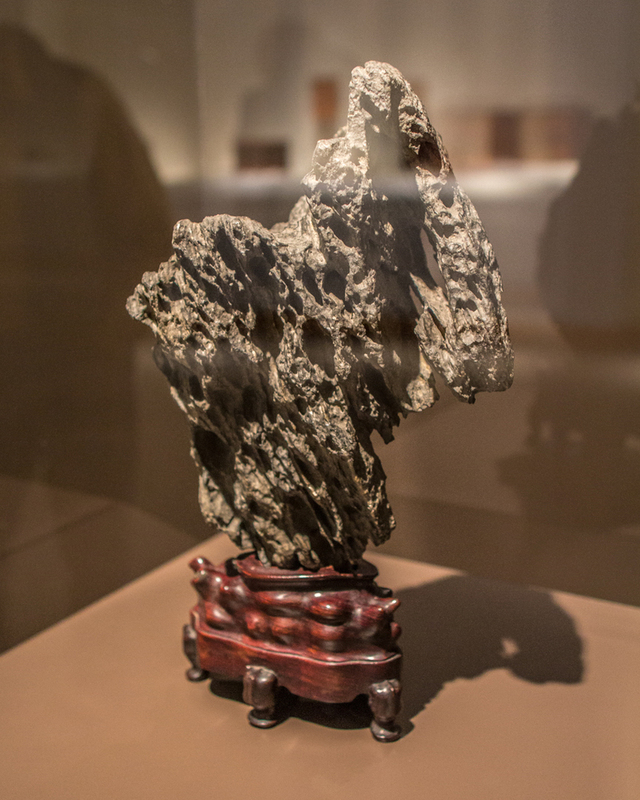 Traditionally, a scholar displayed his choice rock on a finely carved wooden stand, both to support the irregular form, and to designate the rock as a special item, like a piece of sculpture. And sculpted they were. Once chosen from nature, scholars’ rocks were frequently carved, weathered, and burnished to suit their owner’s aesthetic. Collecting a scholar’s rock involved both selection—the finest rock would inherently resemble a painting by the powers of nature—and manipulation—as the scholar imprinted their aesthetic onto the rock form by carving or treating it in some way. There is a fascinating give-and-take here, a loop of influence whose beginning and end is hard to identify. As much as the natural forms of rock, and the mountainscapes they represented, informed styles of scholarly painting, the Chinese literati also made natural rock conform to their vision of a painterly landscape, molding it into their idea of beauty. ¹Robert D. Mowry, “Chinese Scholars’ Rocks: An Overview,” in Worlds Within Worlds: The Richard Rosenblum Collection of Chinese Scholars’ Rocks. Exh. Cat. Cambridge, Mass. : Harvard University Art Museums, 1997; 19. ²Mowry, “Chinese Scholars’ Rocks,” 20. ³Mowry, “Chinese Scholars’ Rocks,” 21. ⁴David B. Williams, Too High and Too Steep: Reshaping Seattle’s Topography, Seattle: University of Washington Press, 2017. The Way coagulates into mountains. Shan Shui, or river and mountains, is a Chinese term for landscape. 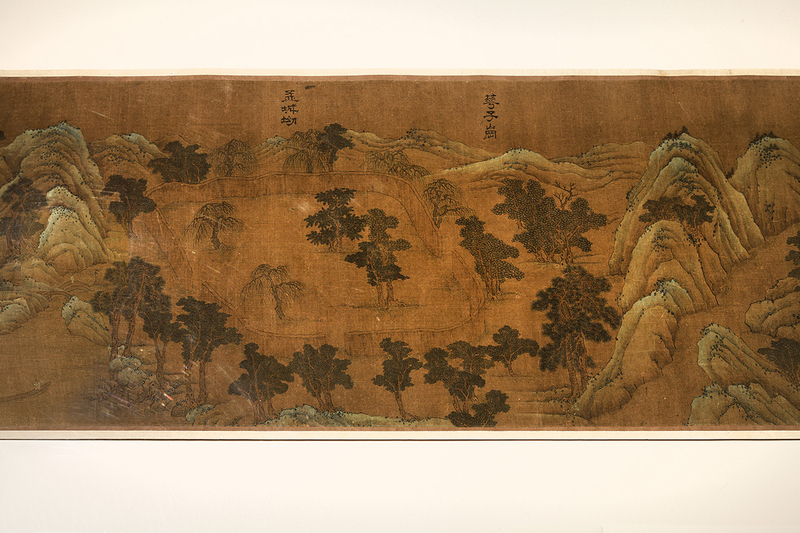 During the Six Dynasties (220 AD–589 AD) Shan Shui became a popular style of landscape painting as well as referring to a specific form of landscape poetry. In Terratopia: The Chinese Landscape in Painting and Film at the Asian Art Museum you will see examples of Shan Shui painting as the exhibition displays centuries of works to examine the role of landscape as an enduring subject of artistic, philosophical, and environmental reflection from the 3rd to the 21st century. 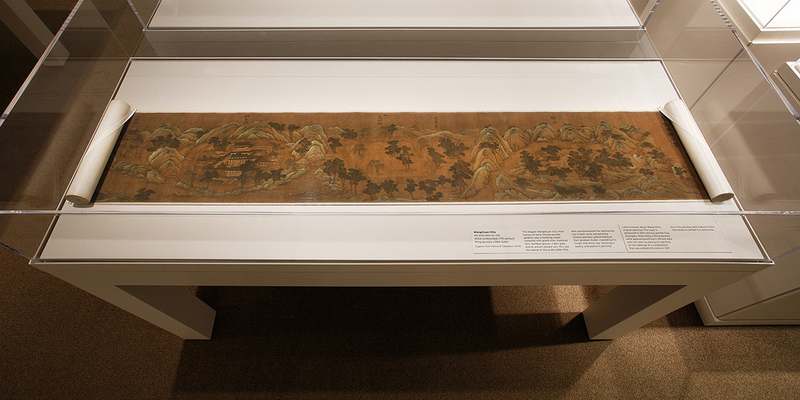 In the paintings of the exhibition, you’ll notice calligraphy on pieces such as Wangchuan Villa (17th Century). The inscription refers to a series of Shan Shui poems by Wang Wei whose country retreat at Wang River is depicted in the painting. Wang’s couplets, focused on the natural landscape of his retreat, are collected, with the poems of fellow poet Pei Di, as the Wheel River Sequence. A sample of these poems, meant to convey imagery and tranquility are below. hints of drifting voice, no more. light ablaze on green moss, rising. one bird follows another in flight away. scatters. Evening mists: nowhere they are. Flute-song carries beyond furthest shores. In dusk light, I bid you a sage’s farewell. mountain greens furl into white clouds. Perhaps one of the most iconic pieces of writing that begins to unfold a long history of the role of poetry in Chinese landscape painting is written on The Orchid Pavilion Gathering created in 1732 by Chen Fu based on the original work of Wang Xizhi (303-361), the whereabouts of which has been unknown since the Tang Dynasty. This calligraphy is the Lanting Xu (Preface to the Poems Composed at the Orchid Pavilion), written as a preface to a collection of poems generated during the famed Orchid Pavilion Gathering of literati. Read the Lanting Xu to begin your own journey into the poetry associated with the works of art you can see at Asian Art Museum before Terratopia closes. If all this poetry has you yearning for more landscapes, come to Seattle Art Museum to see Seeing Nature: Landscape Masterworks from the Paul G. Allen Family Collection, on view through May 23. 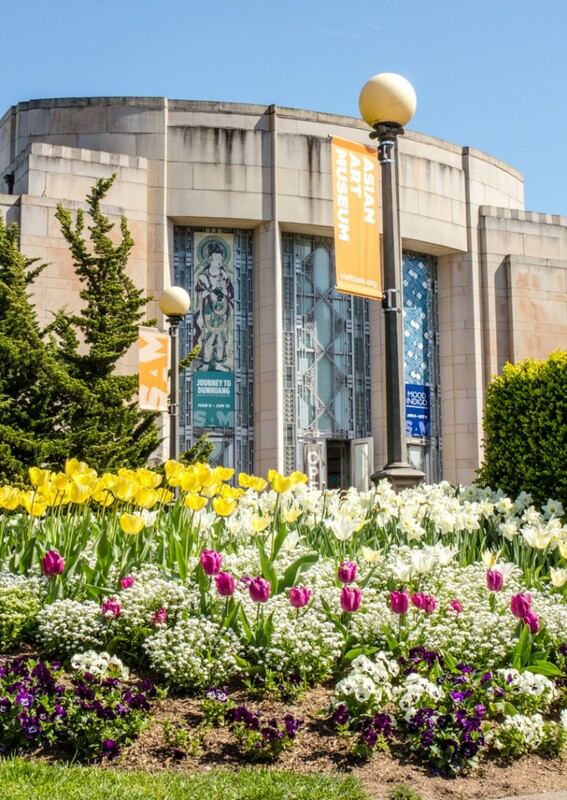 And keep in mind, the Asian Art Museum is temporarily closing for renovation beginning Monday but installations featuring SAM’s Asian art collection will continue to be on view at the Seattle Art Museum for all to take retreat within. 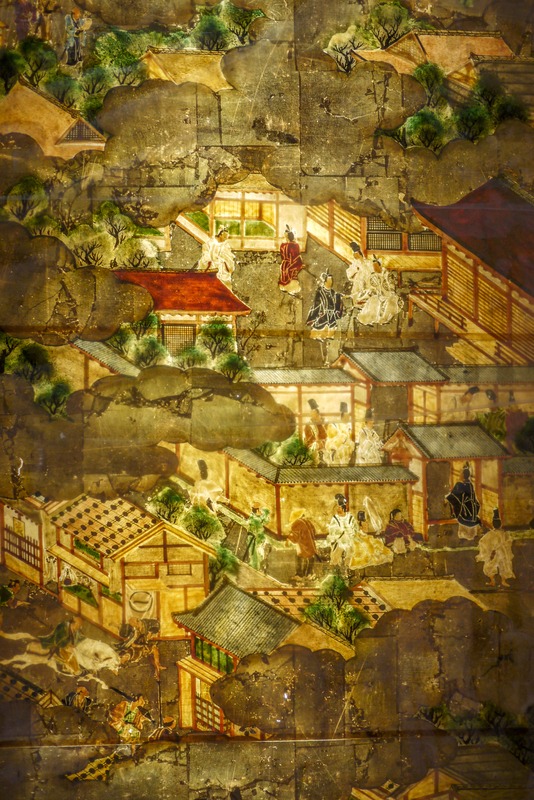 Images: Wangchuan Villa, 17th century, Wang Wei, Chinese, ink and color on silk, 36 ft x 11 13/16 in., Seattle Art Museum, Eugene Fuller Memorial Collection, 47.142, photo: Mark Woods. The Orchid Pavilion Gathering (detail), 1732, color added 1739, Chen Fu, Chinese, active 1730s, ink and color on paper, 13 1/4 X 25 7/8 In., Seattle Art Museum, Eugene Fuller Memorial Collection, 52.138, photo: Elizabeth Mann. Wang Wei, The Selected Poems of Wang Wei, trans. David Hinton. New York: New Directions, 2006. Why do you love art? Art makes us ask questions. It makes us stand on our tippy-toes peeking around the painted street corner. It sparks our curiosity. It inspires us, charges our batteries, and makes our souls richer. What are your hobbies or passions? In my free time, I explore caves. When you’re in that cave, there is nothing else. The world outside does not exist, because the possibility that you will never see daylight again is always present. In a way, caving is like space travel, the last frontier, the ultimate mission into unknown. The promise that it holds is breathtaking beauty, exploration, adventure, and, of course, discovery of something we didn’t know about ourselves. You’re testing your own limits, you’re watching your every move, and you’re trying to absorb as much as you can from your surroundings. To me, this is very primal. Do you see any link between your hobbies of cave exploring and art? I think it’s curiosity, because what I wrote about art is actually what I used to do when I was a little kid. My aunt had a painting of a street corner that veered off and you couldn’t see where it was leading so I thought if I got myself in the right position, somehow I would see the other side of the street. It’s the same thing about caves—it’s searching for the next thing around the corner and just being curious. The curiosity that we have as the human race, I guess. You’re a change management consultant. What does that mean? 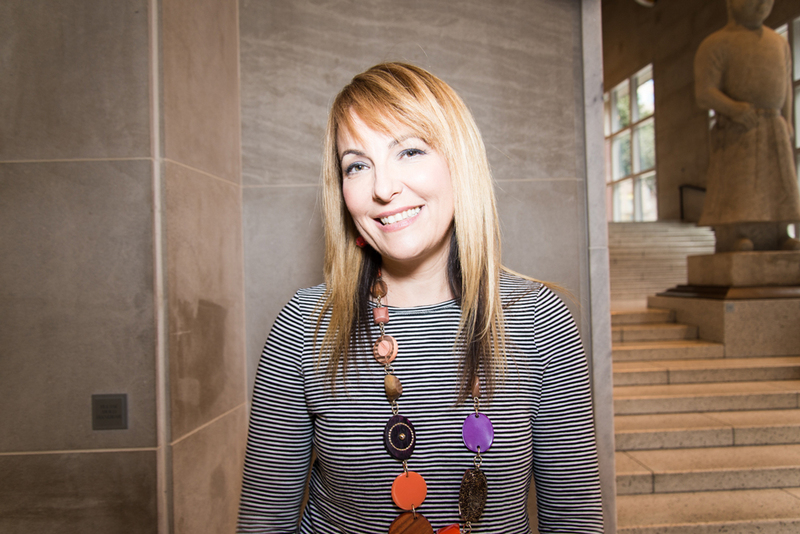 Change management is an emerging field that’s growing here in the Pacific Northwest. We have an international organization where we help organizations to transition. It could be anything from companies moving or implementing new software or having a merger with another company. We help with preparing people for the new world. I’ve been doing this for 7 years. What’s your favorite SAM location? Do you have a special spot to visit? SAM’s Asian Art Museum. The museum has such historical value and it’s just so beautiful. The setting in Volunteer Park—and all of it—is just great. I love to visit Monk At The Moment Of Enlightenment. I found looking at the other Asian art that’s exhibited there from that period that you don’t see a whole lot of expression on the face (in general) and he has this expression of bliss that I think is so hard to capture—even for something that is that old and made in wood. That moment of enlightenment that we all hope—well, maybe not all but some of us hope—to maybe live someday. I think it’s a really uplifting piece of art and pretty unique to what I’ve seen. I don’t claim to be an Asian art connoisseur so I just enjoy it. Yes, we like the things we like. You’ve been a member since 2011? Yes. I really didn’t realize how easy it is to be a member. I got a gift membership that year and I was thrilled. I just love coming to the museum and it definitely pays in multiple ways. Not just financially. Here you get that sense that art is accessible and that’s really the appeal to me: being a part of it, being able to support it in some way. 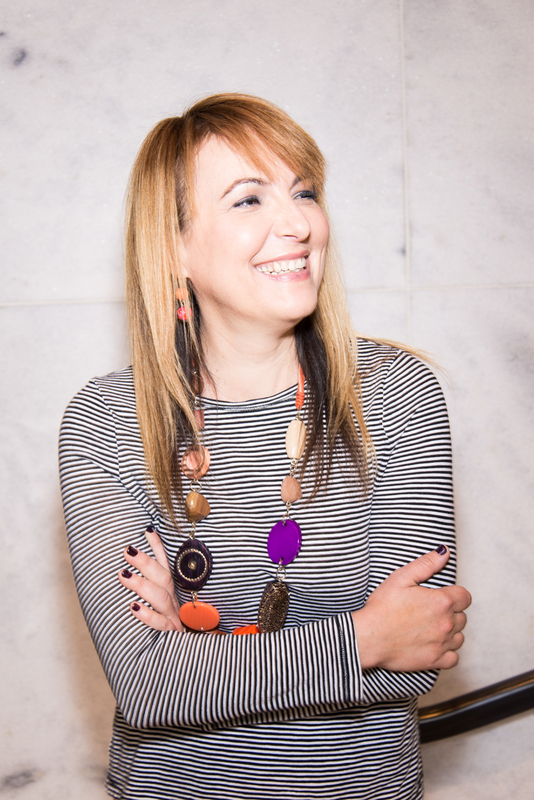 If you, like Mariana, love the Asian Art Museum, get enlightened on what’s happening as we begin our renovation and expansion of the historic home of SAM. Members make our world go round and you can help ensure the future of the Asian Art Museum by becoming a member today or making a donation to the renovation of the iconic Art Deco building. Refined compositions and striking color combinations characterize one of the most recognizable Japanese art forms: the ukiyo-e print. Ukiyo-e are woodblock prints produced during the late Edo period (1615-1868) in Japan. In Tabaimo: Utsutsushi Utsushi, Japanese artist Tabaimo (b. 1975) honors two acknowledged masters of ukiyo-e: Katsushika Hokusai (1760-1849) and Utagawa Hiroshige (1797-1858). Because Tabaimo is looking back to the artists of her culture’s history, borrowing color patterns and design elements, her work feels like the continuation of a conversation. By including some of the same formal elements associated with a traditional Japanese art, Tabaimo picks up that thread of history, honoring it, but also carrying it forward. As her existing and new works are displayed in the Asian Art Museum, interspersed with some of the treasures of SAM’s Asian art collection, we can appreciate even better how art history has informed Tabaimo’s work, the work of contemporary Japanese artists, the work of contemporary digital media artists, et cetera. Here, we are highlighting one memorable ukiyo-e from Katsushika Hokusai that you’ll find in Tabaimo: Utsutsushi Utsushi. Titled South Wind, Clear Dawn (Gaifu kaisei), the print has been commonly referred to as Red Fuji—which, I have to say, turns my mind to produce, and not landscapes. Nonetheless, we can see why the color of the print has been singled out as the identifying characteristic. The mountain peak is a rich, chocolatey brown, and the snowcap leaks down the mountain into textured trails, like an icing stingily applied. Where the snow trails end, brown fades in a gentle gradient to the soft red for which the print is known. Lower down, an army of conical, gray-blue trees (faded from green) carpets the base of the mountain. With the trees’ diminutive size against imposing Fuji, and the way different arms of the forest reach across the mountain’s base and up its side, they are like an invading arboreal-ant army. The line of the mountain divides the print cleanly into foreground and background, where a deep blue sky fends off rolling clouds. 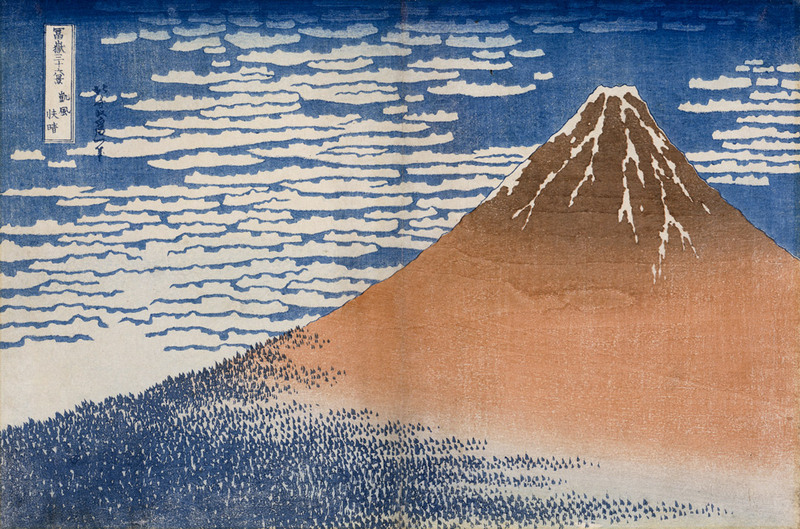 Part of the series Thirty-six Views of Mount Fuji (Fugaku sanjurokkei), the Red Fuji would stand out from the rest because it was so rare that the mountain would appear with this hue. It only occurred under special conditions, in late summer or early fall, and when the winds were blowing from the south. SAM’s version is from the second printing, notable because the mountain reveals marbled woodgrain, a poetic remnant of the wooden block from which this scene was printed. As they have for Tabaimo, may the distinctive colors and designs of your histories also lead you forward. Image: South Wind, Clear Dawn (Gaifu kaisei), from the series Thirty-six Views of Mount Fuji (Fugaku sanjurokkei), ca. 1830-32, Katsushika Hokusai (Japanese, 1760-1849), woodblock print, sheet: 9 7/8 x 14 3/4 in. Seattle Art Museum, Gift of Mary and Allan Kollar, in honor of the 75th Anniversary of the Seattle Art Museum, 2010.15. Celebrations of spring are happening all around us. It’s opening week for baseball and Masters Tournament time in golf. Here in Seattle, the sun is shining, the flowers are blooming, and all of a sudden it’s like we live in a populous city. You never have a sense for how many people live (and vacation) here until the sun comes out! As wonderful and anticipated as these developments are, today we’re focused on another springtime celebration: It’s Buddha’s birthday! To be precise, it’s Buddha’s birthday in the Japanese tradition; the same event is remembered on various dates in spring across the world. Many Asian countries commemorate Buddha’s birth on the first full moon of the 4th month in the Chinese lunar calendar (which falls in May). Japan adopted the Gregorian, or Western, calendar in the 19th century and moved its celebration of Buddha’s birthday up to April 8, about a month earlier. Thankfully for both our regular visitors and out-of-towners, we have a bevy of fine Buddhist art at the Asian Art Museum to help everyone celebrate appropriately. The new installation Awakened Ones: Buddhas of Asia highlights some of the finest representations of Buddha in the museum’s collection, including this stunning wood sculpture coated with gold lacquer. 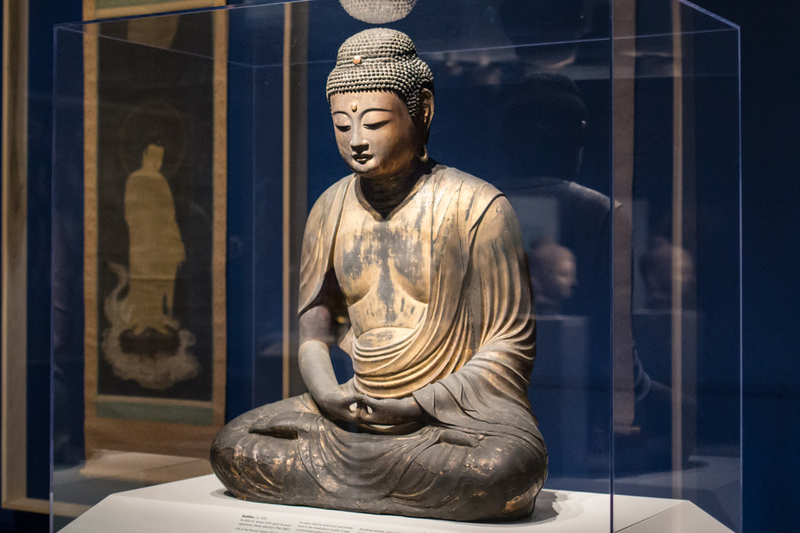 Called an Amida Buddha for its symbolic form, the figure was crafted during the late Heian period (794-1185) in Japan. Its maker used the yosegi-tsukuri technique, carving wood blocks, hollowing them out, and then assembling them together. The Buddha strikes a meditative pose that exudes total peace. In Japanese Buddhist traditions special connections exist between Buddha and the flower that make celebrating him in the springtime especially appropriate. Hana-Matsuri, the Floral Festival, is a memorial service performed at temples throughout Japan on Buddha’s birthday. Those who make pilgrimages to the temples bring offerings of fresh spring flowers and libations of tea. For its original installation in a Kyoto temple, this Buddha sculpture would have been seated on a lotus pedestal. The company he keeps in Awakened Ones, where he is surrounded by sculptures and paintings from China, India, Korea, Nepal, and Pakistan, leaves one with a sense for the wide reach of Buddhist teachings and the many ways Buddha is pictured and remembered. IMAGES: Buddha, ca. 1130, Japanese, wood with gold lacquer, 37 1/4 x 27 x 17 in. 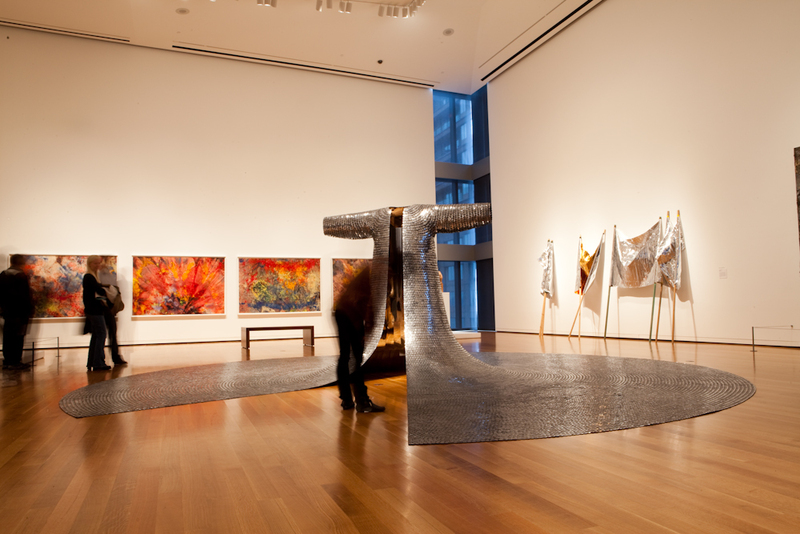 Seattle Art Museum, Gift of the Monsen Family, 2011.39, Photo: Natali Wiseman. Photo: Natali Wiseman. 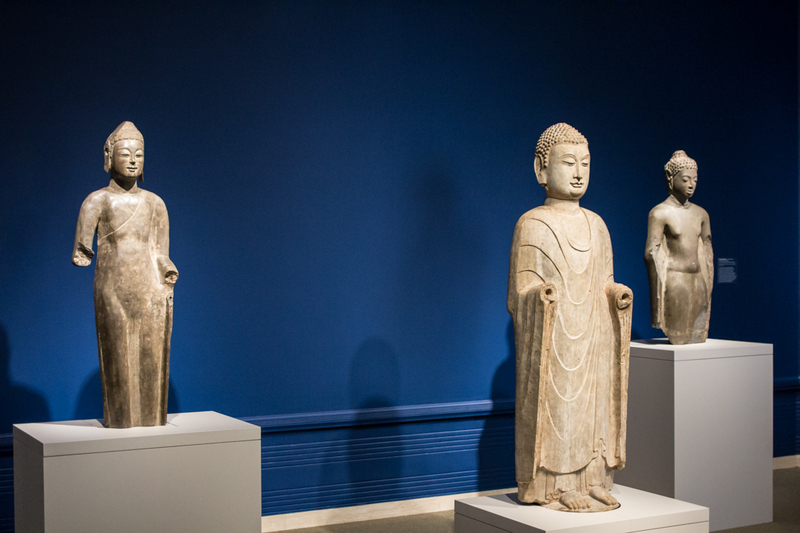 Installation view of Awakened Ones:Buddhas of Asia at Asian Art Museum, © Seattle Art Museum, Photo: Natali Wiseman. 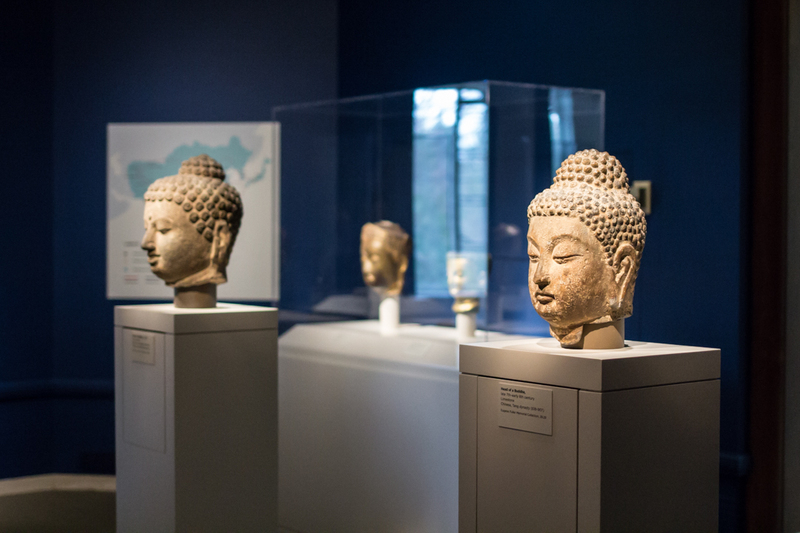 Installation view of Awakened Ones:Buddhas of Asia at Asian Art Museum, © Seattle Art Museum, Photo: Natali Wiseman.